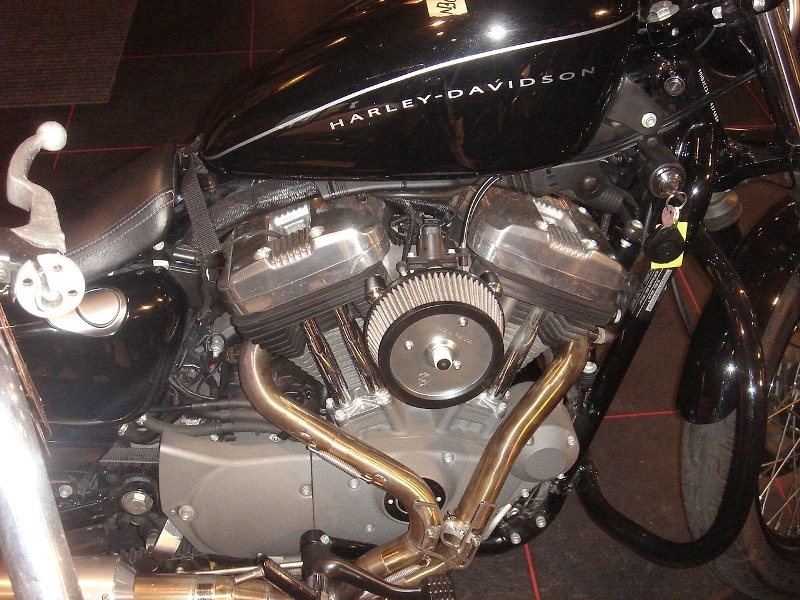 20-3-2012 - In this article we will discribe the tuning with our Twin Motorcycles stage 1 KIT with the Torque Hammer full exhaust system for the Sportster Nightster. 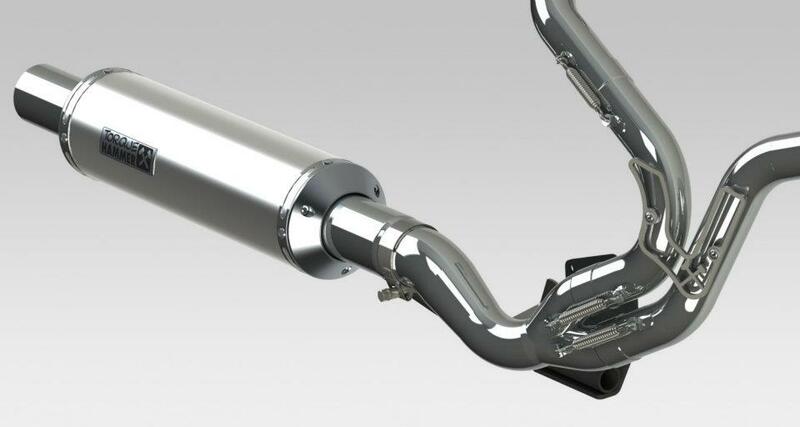 In this article we will discribe the tuning with our Twin Motorcycles stage 1 KIT. Above is a bone stock Harley Davidson Sportster model Nightster 1200cc 2009 model. 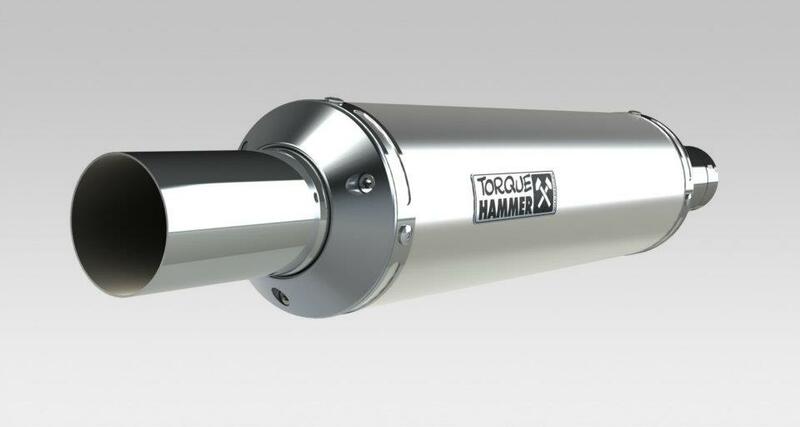 Off course this is with our famous Torque Hammer exhaust system we developed specially for the Harley Davidson sportster models. This version of the Nightster has mid controls, in the erlier article when we tuned the Sportster 48, you can see it fit's also perfect for the forword controls. We will completely build this bike with our stage 1 KIT the same way as you would do it at home. Our kits are famous because of the amount of time we put in the tuning and exhaust development for you. We are also worldwide famous for these stage 1 kits, our kits are bold on kits, complete and used worldwide. Normally we ship the stage 1 KIT and you will do this at home. Or you can buy them at 1 of our worldwide dealers. 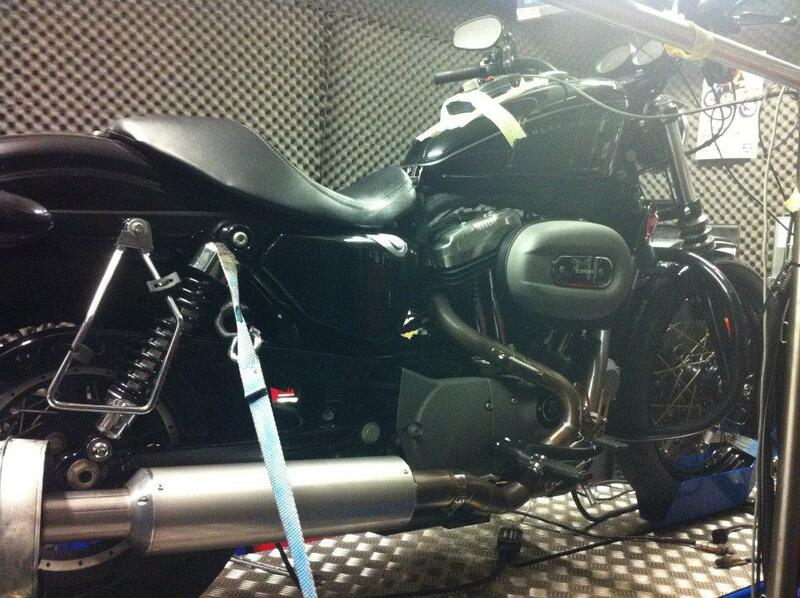 Now we will show you what will happen if you put your Sportster on the dyno with our stage 1 kit. I now will dyno her for the last time completely original to see what the results are then we will dyno her with our stage 1 kit. Oke after warming up the bike for 20 minutes, i made a stock run, look down for the results. (55 PS and 62.71 lb-ft of Torque). 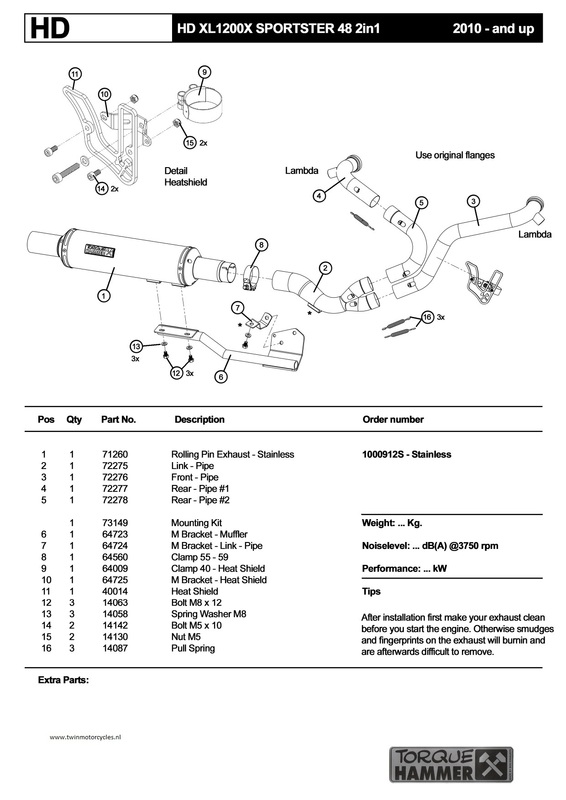 To give you all a idea what will happen today when we install our Complete Stage 1 KIT with tune have a look down. 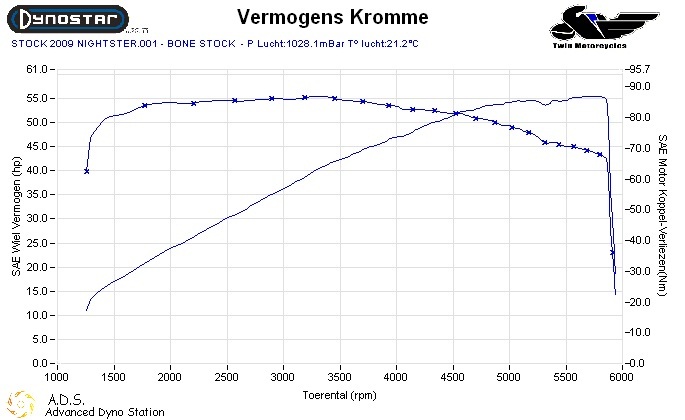 Yep I know, between 80-83 HP SAE corrected on the rear wheel and 108-110 NM of Torque. 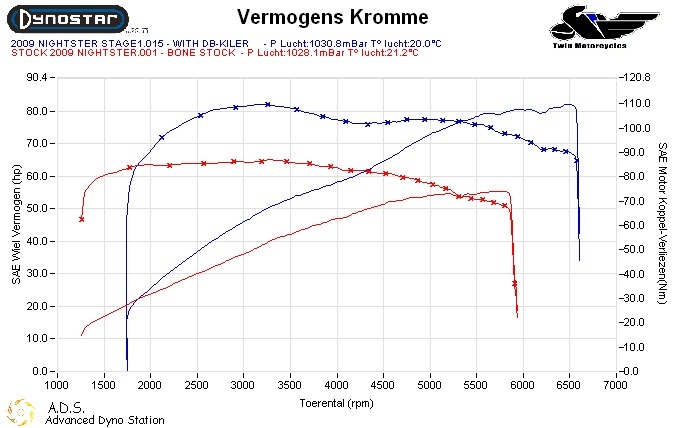 Later today i post the sheet with the run with the Bike, The above run was made on my dyno with a Sportster 40 with the Stage 1 Kit and DB-killer removed. 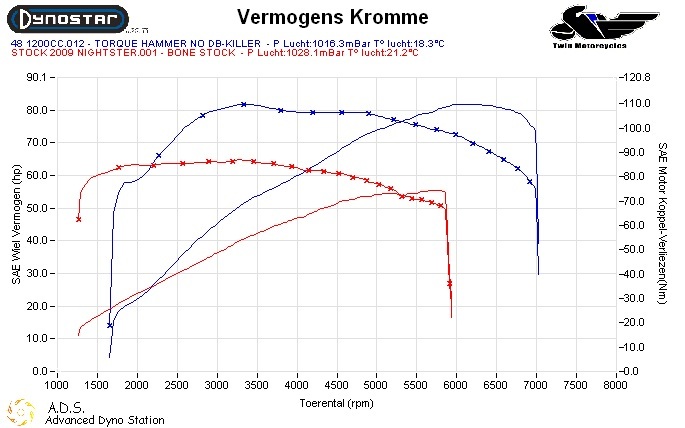 We are able to develop a db-killer with almost no loss in HP and Torque wonderfull.. 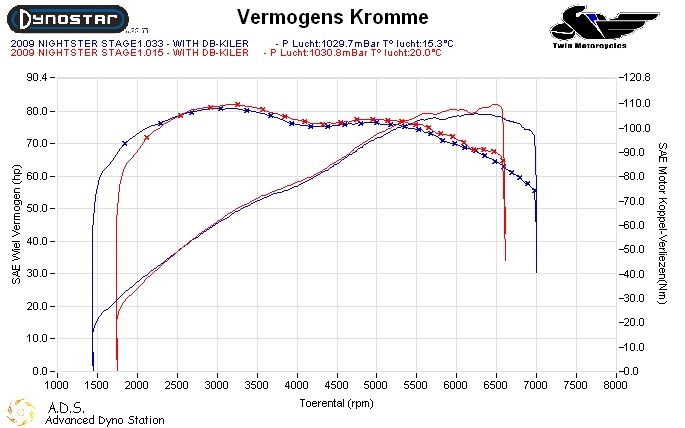 Here is the compare between the stock bike from today and after the install with our Stage 1 KIT WITH the db-killer. 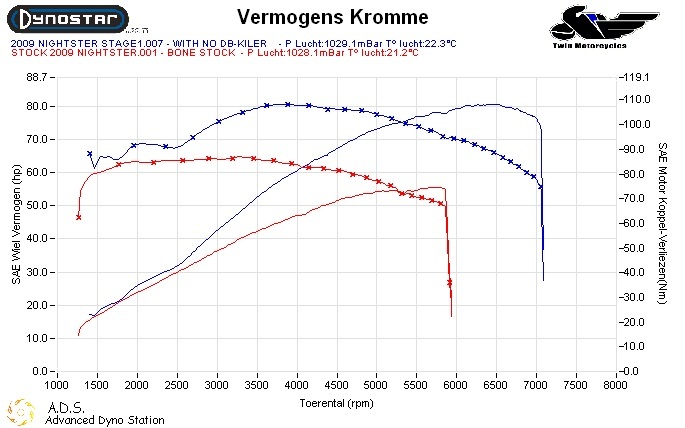 Our stage 1 with db-killer installed makes 110 NM of Torque and 82.2 HP SAE corrected on the rear wheel. 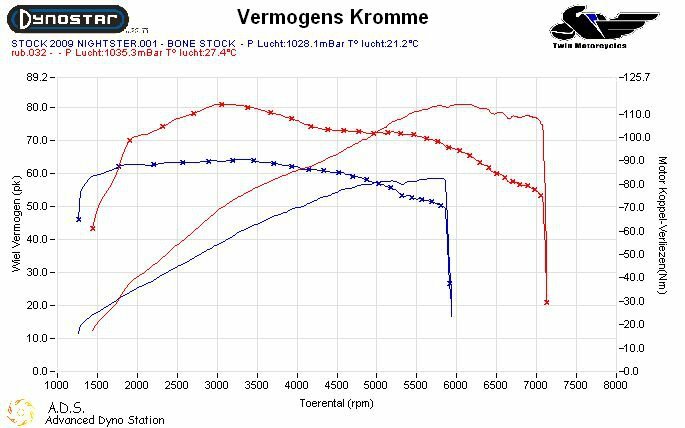 And here is the Graph with the stock bike from today and WITHOUT DB-Killer, the bike makes 108 NM of Torque and 80 HP SAE corrected on the rear wheel. Today i hope to test some airbox setups. The goal is to find a good performing solution payable and to give customers a choise for choosing there own style. I hope i can finish it today otherwise it would be next week, becuase i need to help a Dealer in a foreign country tomorrow. 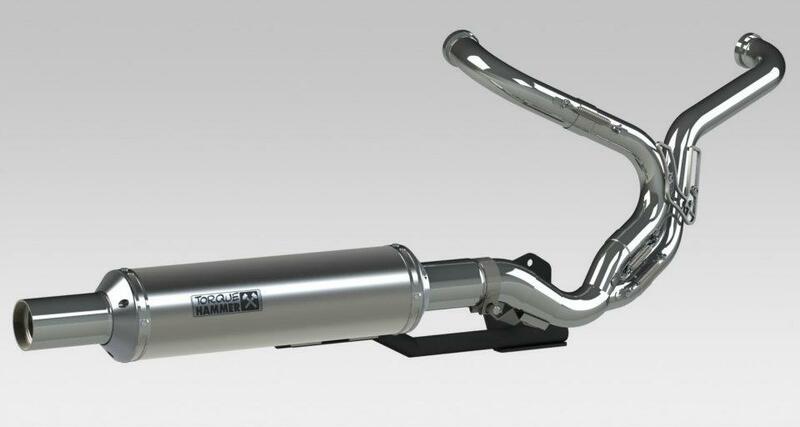 All testing is done with our Torque Hammer exhaust for the Sportster With the db-killer installed. centering the original cover for protecting it for heavy rain.. The performance is 79.3 HP at 6242 RPM and 108 NM at 3180 RPM of Torque SAE corrected on the rear wheel. Is the biogger small sucker air filter, this is a larger filter that wil NOT fit in your stock cover. You can purchase different design outer covers. Later we will put them in the shop. The Performance is a little better then the little big sucker filter 82.2 HP at 6400 RPM and 110 NM at 3159 RPM. That is an increase of the little filter of 2.9 HP and 2 NM of Torque. Not bad for only a filter swap. Here are the 2 graphs of the filters together to give you a better understanding. Here is the graph with the compare of the 2 filters. Later today we will recieve the K&N filter for the stock airbox. We will test this stock and with some holes to show you the difference. We also made some movies to let you hear the sound with the db-killer installed. Our setup performance very well. We doubt if you can buy a complete kit in the world that has more love and passion in the developing of it then our kit. Here is a nice movie with a Sportster 48 with our stage 1 kit. 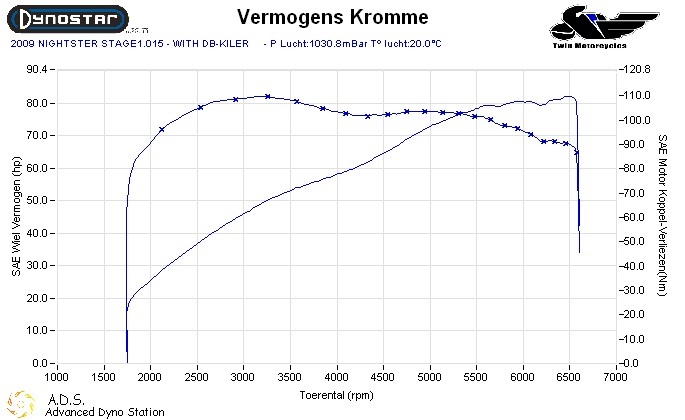 I finished this morning the tuning and fuelmap of our Stage 1 Kit for the Sportster 1200CC. The bike dynoed stock 58,79 RWHP and 91 NM of Torque. 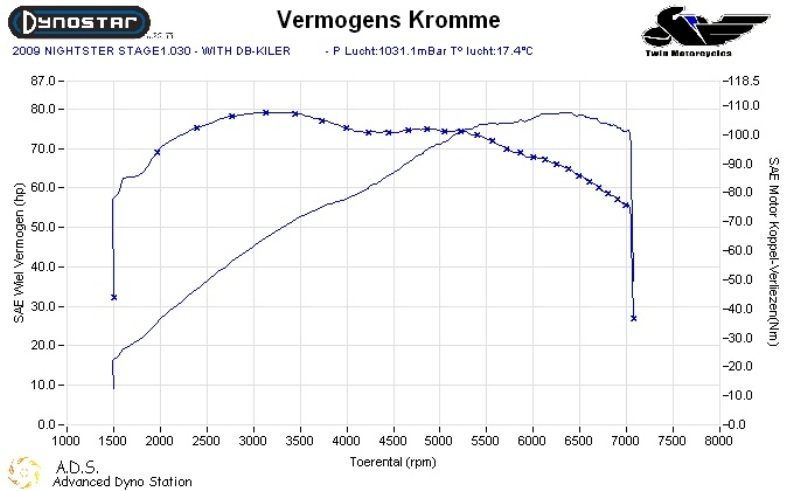 After we installed our Stage 1 kit Torque Hammer 2-1 system with a replacement K&N filter in the stock airbox we achieved 81.1 RWHP and 114 NM of Torque, That is a result of 22.4 RHHP and 23 NM of Torque The bike is for a lady i hopes she holds on.